Peer outdoor support therapy (POST). Vision: Trojans trek will be recognised as the most effective peer support wilderness based intervention which reconstructs the psychological health and well being of service and ex service personnel. Mission. Trojan’s Trek plan, conduct and evaluate wilderness based peer support interventions to assist service and ex-service personnel, adversely affected by their service. Context. 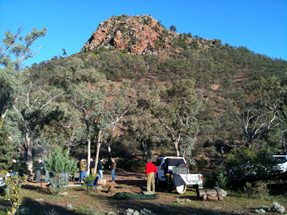 Trojan’s Trek is a program which was first run in the North Flinders Ranges of SA in the late 1990s to assist troubled Vietnam veterans return to a normal life. During the trek, individuals will be acquainted with a number of options needed to adjust thinking, make better choices, adapt behaviors and practice new skills which will be applied in his or her domestic situation. Participants are compelled to step outside their comfort zone and take stock of their lives both individually and collectively. The program is live-in, is highly individually focused and delivered by staff that have the necessary accreditation. More importantly they are also ‘warriors’ who have experienced and overcome the same frustrations as those attending. This aspect of staff selection is vital to the outcomes as many of those attending come to regard the older veterans as role models. Trojan’s Trek provides the setting and conditions under which participants will experience a lasting positive shift in values and interpersonal relationships. The trek is designed to improve lifestyle and community involvement. Trekkers are encouraged to face activities and situations which may have been avoided in the past by trying new ways of behaving and reacting. For more information on the instruments and methods used to evaluate the outcomes of Trojan’s trek there is a detailed pdf available here. For a final report by the Australian Centre for Post Traumatic Mental Health (ACPMH) on the 2009 trek click here. It was arrived at by administering a series of standard psychosocial tests to the participants and their partners. In general it shows that the qualitative results, which were very good in terms of benefits, far outweighed the quantitative results. In 2013 UniSA also evaluated Trojan’s Trek results using the same instruments as part of a masters thesis by Kendall Bird. The results were classed as excellent, establishing new bench marks for peer support programs of this nature. See report elsewhere on the site.